In the world of fashion and beauty, some partnerships are more intriguing than others. It's highly the case for Lancôme by Alber Elbaz, the upcoming collaboration between La Maison Lancôme and Lanvin's visionary designer. The limited edition collection will feature highly colorful eye shadows and lipsticks and is set to hit the stores on June 15th. Lancôme International President, Youcef Nabi, says: "Alber Elbaz is, without a doubt, one of the world’s most influential fashion designers. But beyond that, he is also the most talented. His sense of luxury, his vision of femininity and that hint of audacity resonate perfectly with the new values of Maison Lancôme. We are extremely proud and happy that he is set to channel his universe into the world of make-up for the very first time." To keep us waiting (with excitement! 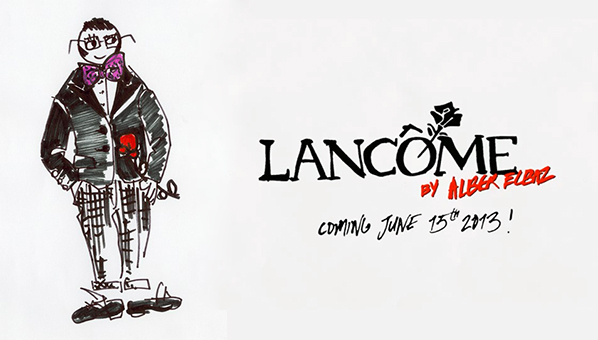 ), the beauty brand has put together a quirky teaser illustrated by Alber Elbaz himself. Adorable, n'est-ce pas?